Local business marketing: Interestingly, consumers largely use the same decision process to find, evaluate and hire or purchase products from local businesses as they would an national corporation. In the past finding a local business took place mainly offline, through magazine ads, flyers, person to person verbal referrals and other physical marketing promotions. Today, these very same activities have transitioned to the online world. As a local business you have seen the significant shift to digital marketing and know you need to take action, but how? The model is simple, you need to shift your marketing to target in the places your primary audience is visiting online. The challenge is how to determine where these customers are online, how to connect with them and how to nurture them from a cold prospect into a devout customer? Our Local business marketing strategy achieves just this, through clever use of tactics and tools we can identify and target specific demographics (gender, age, interests) and geographic (state, city, zip code) with a message that directly relates to EACH AND EVERY stage of a customer’s purchasing decision process. Best of all, you can measure how successful your marketing is at any time ensuring you can continuously measure, refine and improve your marketing efforts. At the end of the day the local business owner is able to pay for marketing that works, eliminate what does not work and focus their budget on growing their customer base. This is what Lead Discovery does for local businesses. We create local business marketing strategies to help you shift your marketing into the online world. Our tactics control the entire customer life cycle just the same way a global corporation would do, but our experience, tools and marketing savvy allows us to do it at a fraction of the price. What is a Local Business Internet Marketing Strategy? Local Paid Search Advertising, such as Pay Per Click (PPC) on search engines and local directories gives your business instant and direct access to an interested customer base. The ability to target a specific audience and location using a precise budget gives you a great deal of control and security. Since you’re advertisements are triggered by the search terms a prospect uses you can be sure that your ads target their exact motivations. IE: Ads that introduce your business can be tied to general searches like “San Diego Dentist”, or a specific searche like “No Pain Dentist for Root Canals in San Diego” would trigger an ad with that exact benefit. You can have an ad that matches any particular need or concern your potential customers may have – the possibilities are limitless. Now you can see how online advertisements can be far more effective than “shot gun” style print, radio and TV ads. Online Evaluation – Social Marketing: These new prospects that you introduce yourself to will then start to filter out their options by actively evaluating your business through their social networks. They will read through ratings and reviews on the BBB, Google Local or Yelp, ask friends for recommendations on Facebook and Google+ as well as reading blogs or watching videos on youtube.com. This area of evaluation is often lacking or missing altogether for many businesses, yet it is a key element to support your online marketing efforts. You don’t want to pay for advertising of any kind only to be filtered out at this stage. If you have passed the consumer’s evaluation filter it is now up to your website to convert these prospects into sales during the moment of purchase. At the moment of purchase your website really needs to shine. A well designed website will provide a clear and logical path through the website to your conversion pages A conversion page is simply the web page where your visitor ultimately decides if they will buy from or contact you. All conversions are tracked and analyzed giving you the ability to determine what marketing campaign generated this new customer and how much that cost you. 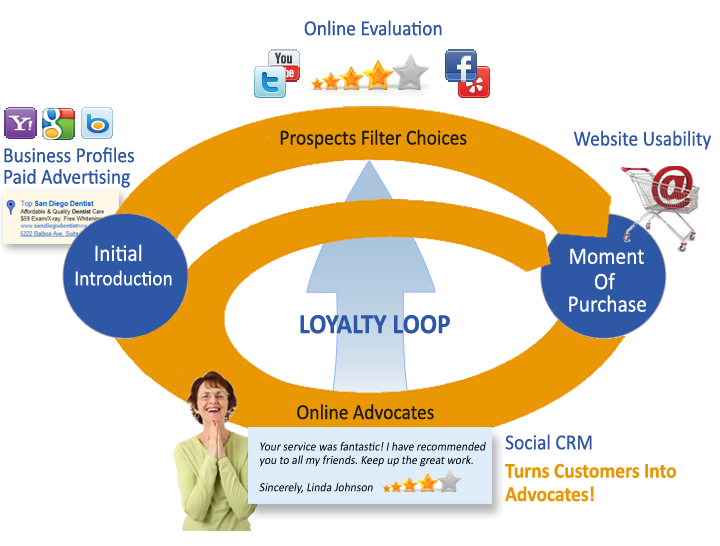 The most important part of a complete marketing loyalty loop is turning a sale into a loyal customer who advocates for your business online. Social media gives businesses the ability to listen “everywhere” for any comments, reviews or ratings your customers write about you online. By connecting with and nurturing these customers with support, perks, or just helpful answers you turn customers into online advocates. These high value customers will post their positive comments to their social networks which directly supports the initial introduction (Paid search) and Active Evaluation phases of the loop. The system starts to snowball on its own. Imagine if out of all traffic that came to your website back in 2016 an extra 20% turned into a customer? And all of these new customers wrote positive reviews about your business on Google, Yelp or Facebook for new visitors to find online in 2017? That is the engine of an effective online marketing loyalty loop. By providing exceptional service, connecting with your new customers and supporting them online, your new customers become your loyal advocates, your free promotional sales force. Local businesses are keenly aware that personal referrals are what have powered their businesses for years, Lead Discovery can help you transition this model online by leveraging your customers voice through social media channels. Lead Discovery’s San Diego local business marketing can create a powerful yet affordable marketing loyalty loop for your local business. Stop struggling with incomplete and unattached marketing campaigns, allow us to grow your sales in 2013. Our marketing service is based on a monthly flat fee that includes all aspects of setting up your local Internet marketing strategy and managing your campaigns for you on a continuous basis. No set-up fee or long term commitments. An affordable and predictable investment where your returns can be measured monthly.